Brrr….. its been a cold week, but at least sunny too, and I’ve promised myself I won’t make the weather the topic of every blog – well you know how us Brits like to talk about the weather! Instead my aim is to try to help potential visitors to Slovenia with ideas and tips for trips around Slovenia, and in particular in and around Radovljica, together with giving a little bit of insider information on life here too. I had a nice day out in Ljubljana on Friday. I go there to work once a month, which makes a nice change for me as I work from home so don’t have much social contact with people, and although I’m not a city person, and wouldn’t want to live and work there, Ljubljana certainly doesn’t have that intimidating big city feel. In fact, many people say it’s more like a lot of little villages together and I’d agree with that. I love going for a walk in Tivoli Park, you can totally forget where you are, a definite oasis of calm and green in the centre of the city. I also love walking up to Ljubljana Castle for a great view over the city and from here you can get a perspective of the relatively small size of the place as the mountains beyond the city seem almost within spitting distance. Actually that’s one of the advantages of Slovenia in general – its smallness, which means that nowhere is more than a few hours drive away and you can take your pick from a wide choice of activities and sights without long distances in between. For visitors to Slovenia this means they can pack a lot into a holiday without losing too much precious holiday time driving from A to B. For me, another advantage is that Slovenia is also bordered by 4 other countries; Austria, Italy, Croatia and Hungary, so combining holidays or going on day trips to other countries is easy. I’ll never forget my initial excitement at being able to drive to Austria and Italy to go walking, exploring and shopping, and since there are no borders nowadays, with the exception of Croatia, it’s even easier. From Radovljica there are a number of possibilities for making day trips to bordering countries, whether by car, train or sometimes I even go by bike. Not that I go that often, just a few times per year, as there’s still so much for me to see and do here, but it’s a definite bonus. There are a number of options for reaching Austria by car, the quickest and nearest to me being through the Karavanke Tunnel (payable) or via the Old Ljubelj Pass (free but very steep and windy) to reach Klagenfurt in Austria. To reach Italy I can just drive to Kranjska Gora, which is about 45 mins from Radovljica, then just keep going, past Rateče and straight into Italy, which is incidentally also the way I go by bike. A place I like to go for a hike is up to Tromeja (1508m), which means Three Borders, as it is literally the meeting point of Slovenia, Austria and Italy and it was here that a ceremony took place when Slovenia officially entered the EU. Silly I know but I can remember being so excited when I first walked up there and just couldn’t decide which of the three countries to sit and eat my sandwich in! In the end I plumped for Slovenia since I thought the view was better. Tromeja is popular with hikers, bikers and skiers too. There is a choice of two routes up from the Slovene side, both starting from the village of Rateče. Both routes start ascending on forest roads – the easier routes continues following the road whilst the steeper route goes up through the forest. I could write so much more about other trips in this area too but I’ll leave that until another time and instead offer this wintery photo of me descending from Tromeja and which shows the kind of views you can expect! A spot of snow tennis! The past week has pretty much been dominated by the abundance of snow. Unfortunately there have yet to be any nice cold, crisp sunny days to be able to get out into the mountains walking in it, and of course at the moment the risk of avalanches is extremely high so common sense and caution are the order of the day. 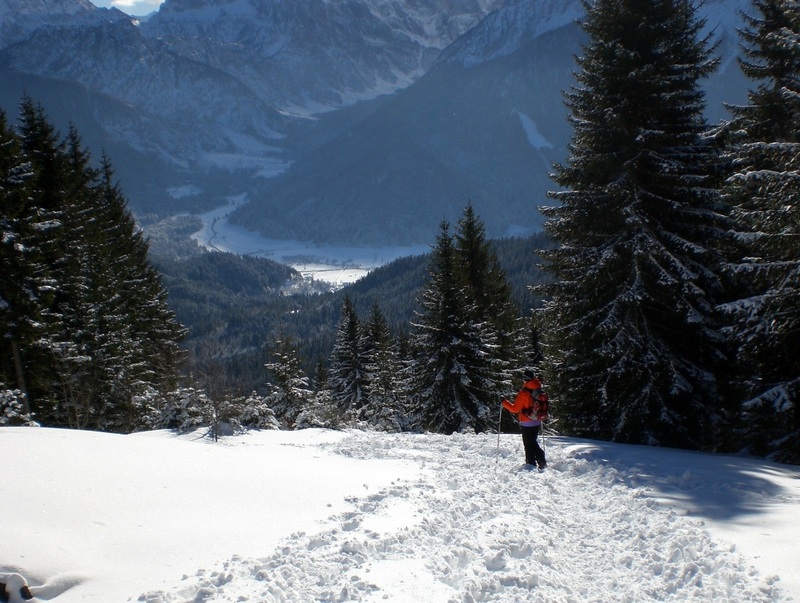 Therefore, it was time for some low-level snowshoeing in the Vrata valley. If you’ve never tried snowshoeing, imagine having a tennis racket strapped to each foot and trying to walk in snow knee-deep. It can feel rather awkward and clumsy at first as one has to adopt a rather wider than usual stance but the snowshoes do at least allow you to walk in the snow without being completely waist deep in it. Well that’s the theory anyway but at the moment, with so much fresh snow, it still felt like wading through knee-deep mud wearing tennis rackets – I discovered muscles I didn’t know I had! Vrata is one of three beautiful alpine valleys in the north-west of Slovenia. Of the three valleys, Vrata is the most impressive and is a popular start point for walks into the high mountains, particularly to Triglav, Slovenia’s highest mountain at 2864m. The 12km long valley is also home to the Peričnik waterfalls which are a popular visitor attraction and are easily accessible from the village of Mojstrana. There are two waterfalls; the upper (16m) and the lower (52m) and a great feature is that it’s possible to walk under the lower fall making a great photo stop. In the summer you can walk or drive along the length of the entire valley. The 12km long Triglavska Bistrica path runs alongside the Bistrica stream. It crosses the river in places with short sections of road walking but makes a pleasant walk particularly in the summer being near the cool water and you get to see so much more than if visiting the valley by car. But it’s a long walk and there’s no public transport so bear that in mind. At the foot of the Vrata valley the mountain hut Aljažev dom (1015m) is one of the most visited mountain huts in Slovenia. However, as you can see from the photo below, the valley isn’t accessible in the winter – this is the road which in places has a steep 25% incline. But those persistent enough (that’s me by the way!) can still visit with snowshoes or skis. Actually, this year the road was closed earlier than usual by landslides caused by flooding in the autumn but repairs were already underway before the snowfall so hopefully it will be all ok again by the tourist season. When walking in the winter, whether in the mountains or even on low level walks, you really have to double, if not triple, the time it would usually take to get anywhere and of course you must certainly be well equipped and well prepared. I can’t stress that enough. Having previously lived with a member of the Slovene Mountain Rescue Team, I all too frequently heard reports about accidents in the mountains, both in winter and summer and these are often due to people being unprepared, ill-equipped and over-estimating their abilities. Elsewhere in Slovenia, a public sector strike is scheduled for this Wednesday and the coalition is hanging by a thread with three parties threatening to leave if the PM doesn’t resign. Hmmm, no comment! And here’s an interesting fact which I heard this morning on the radio and didn’t know. Ljubljana University is one of the biggest in Europe with over 64,000 students – three times as many as Oxford University. You live and learn! What a difference a week makes. Last week I was writing about record high temperatures, now we’re under (literally) mountains of snow – at least the skiers will be happy. Since I’m not a fan of snow and I don’t ski, I sometimes question my wisdom of moving to an alpine area but I’m have to learn to live with it and trying to embrace it in that stoic British way! I was woken at 3.20am by the snow plough outside my window, later followed by the now non-stop noise of people shovelling snow though when there’s this much snow it becomes a problem where to shovel the snow to – the pavements are piled high with it and its still coming down. The shovel becomes the accessory of choice at this time of year (fashion editors take note!). However, at least it’s not like in the UK where the whole country tends to grind to a halt for a few cms of snow. Here, even when there is metres of it kids still go to school, trains and buses still run – life goes on! Slovenia actually has 3 distinct climate zones, which for a tiny country is quite a lot. Here where I live, in the northwest the climate is alpine which means warm summers but very cold winters with (usually) lots of snow. The coastal area has a mediterranean climate with mild winters and hot summers – temperatures at the coast are frequently at least 10 degrees warmer than here (why didn’t I move there?!) and the east side of the country has a continental climate, which seems to be a mixture of the other two. However, with the climate change we are currently witnessing, it’s almost impossible to predict the weather patterns regardless of the climate zones. Last winter there was almost no snow at ground level here and the past few summers have been hot rather than just warm, but for now at least, winter is certainly back with a vengeance and it looks like it will be here for a long time yet. I think/hope Slovenia is becoming gradually more known throughout the world. I hope that through this blog my bid to promote Radovljica will help a little too. Perhaps a lot of Slovenia’s recognition is due to some of the recent sporting success. Among them, the (relative) success of the national football team in the European Cup, the victory by the men’s ski jumping team, Tina Maze’s ongoing success in the Women’s Ski World Cup, Petra Majdič and her enormously brave and well deserved bronze medal in cross-country skiing after having broken a rib during a practice session, a gold in judo at the Olympics, a 3rd Olympic medal, bronze this time, for rower Iztok Čop, to go with his gold and silver from previous Olympic games – just to mention a few. But not only this, Slovenia also hosted the Presidency of the EU in 2011 and Maribor, the country’s second biggest city, has just ended its stint as the European Capital of Culture. I must admit I didn’t make it to any of the events in Maribor – in my defence it’s quite a long way (and what with the price of petrol these days…) but I’m fortunate that there are frequently events going on here on my doorstep so I don’t need to go far. Even if there isn’t a concert going it, the beautiful renaissance Mansion House building is worth a look. It forms the centre piece of the old town and houses the Music School, the Town Museum and the Museum of Apiculture (Beekeeping). The Town Museum houses collections displaying the history of Radovljica and its surrounding areas together with a collection of the work of one of Slovenia’s most celebrated 18th century playwrights, Anton Tomaz Linhart, who was born in Radovljica – hence the name of the old town square Linhartov trg (Linhart Square). So if you are visiting, or planning to visit the area, it’s always worth enquiring at the Radovljica Tourist Information Centre (or click the link on my blogroll) to see what’s going on and who knows, I might see you there, or rather here!!! The weather has been almost spring like this past week, which I for one am not complaining about. However, I seem to be alone in that sentiment as everyone else I meet seems desperate for more snow. In fact, I heard last night on the news that last Saturday a record 16 degrees was recorded in Ljubljana, which for January is nothing short of bizarre! Wishing to take full advantage of the mild weather, I went for a walk around Bohinj lake on Saturday afternoon. It’s stunning there whatever the season and this was no exception. It was around 3.30pm so the sun was already starting to set behind the mountains which surround the lake but the colours and vistas were nonetheless beautiful. The walk around the lake takes anything from 2-4 hours, depending on walking pace and how many photo stops are made. During the winter there’s nowhere open to get refreshments en-route so probably best to have something with you. A map isn’t needed as you can’t go wrong. The path is level throughout, but on one side is a little rocky in places with lots of tree roots to contend with so good walking shoes are required, whilst on the other side it’s a normal gravel path. There are endless amazing walks to be done in the mountains in the Bohinj area and no doubt I’ll be writing a lot more about those in future blogs but here’s a photo to whet any interested appetites! Even the drive to Bohinj from Bled is scenic. The road follows a gorge and crosses the Sava river several times. Although most people refer to the area as Bohinj, there isn’t actually a town or village called Bohinj. The nearest villages to the lake are Ribčev Laz and Stara Fužina, at the east end, and where there is plenty of tourist accommodation. 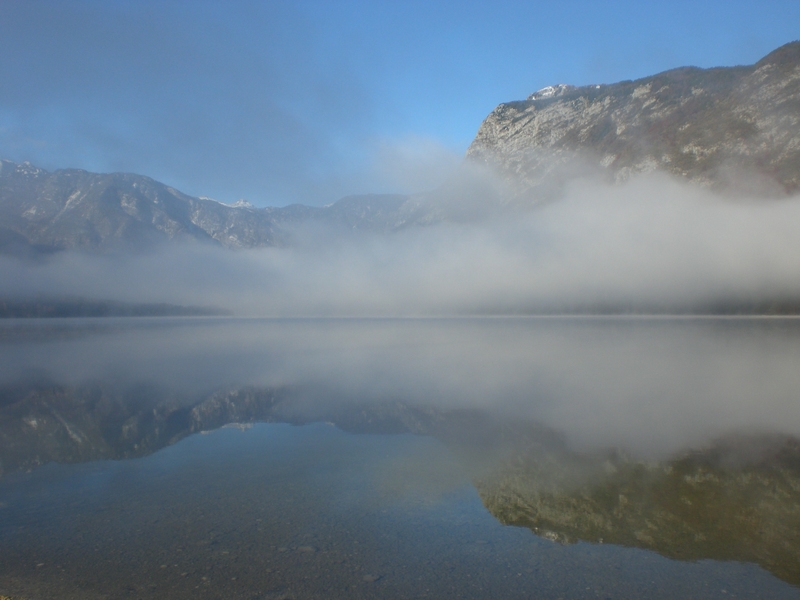 The word Bohinj translates as ‘Gods land’ and most people, on catching their first glimpse, soon understand why it is one of the most outstanding beauty spots in the country. The lake itself is the largest in Slovenia’s and it is fed by the river Savica whilst the river Sava Bohinjka flows out of it. It is 4100m long, 1200m wide and 527m above sea level and in summer temperatures reach a maximum of 20 degrees. It is very popular with bathers during the summer though I must admit I’ve never been brave enough to dip anything other than my feet in it! Of course my life here doesn’t just involve walking and leisure as unfortunately that doesn’t pay the bills. Opportunities for foreigners here are really few and far between and its really tough trying to find regular work. Most of the expats I know (and there aren’t many of us) are in, or have been in, a similar situation – some of them tough it out whilst others have to conceed defeat. Not one to be defeated, my ongoing battle to get more work continues. I’m constantly amazed by people who seem to have the idea that moving somewhere like this is a cheap and easy option, that you can buy a cheap house and grow your own vegetables. Well, vegetables don’t pay the bills and houses aren’t cheap! And it certainly isn’t a cheap place to live, the cost of living is high and ever rising along with a new 50% higher rate tax bracket which has just been introduced. The price of petrol for example has risen 50% since I moved here. However, fortunately for tourists, Slovenia still offers good value for money, particularly in comparison with neighbouring countries such as Austria and Italy. One thing that remains good value here is going out for a coffee or a meal. You can still get a coffee for a euro (not everywhere of course) and a three-course meal for under 10 euros. And going out for coffee is a serious business. Here in my small home town of Radovljica there are at least 15 coffee shops with not a chain in sight and let’s hope it stays that way. First things first, Happy New Year or Srečno novo leto as we say here! I’ve had quite a good start to the New Year so far, except for a little hiccup yesterday – more about that later. Being able to speak Slovene came in very useful last past week when I had the pleasure of spending an hour in the company of two of Slovenia’s national treasures. Ivanka Kraševec Prešern has been one of Slovenia’s most known and successful singers of national folk music since her debut in 1962. She was part of the Alpski Kvintet, who travelled throughout Europe and has received numerous gold and diamond discs, in both Austria and Slovenia. Since retiring from singing, Ivanka turned her attention to painting which has proved another successful career for her and she has hosted several exhibitions. Her husband, Ivan (Žan) Prešern, was a founding member of the Alpski kvintet in 1966, where he played trumpet for over 30 years. As a composer he has also arranged over 300 titles and was instrumental in the development of the jazz trumpet with the well-known trumpet manufacturer Martin Lechner. Today, as well as still playing, Ivan also devotes his time to painting. Just recently Ivan was on TV playing his trumpet to accompany a song specially composed about Radovljica (here’s a link if you want to listen to the song – http://yourlisten.com/channel/content/16938978/Radolca). And both of them live in Radovljica too which just goes to show what a great place it is to live! This is a photo of the remains of Kamen Castle, also in the village of Begunje, with the beautiful Begunjščica mountain in the background. New Year’s Eve was a good one. First out for dinner with some friends then met another friend later in the evening in Bled for a walk around the lake and to watch the fireworks. It was a perfect clear evening too. I was surprised at how quiet it was though. I think most people must have chosen to stay at home and celebrate this year – the recession is still biting very hard here. So now the not so good. I was bitten by a dog yesterday. It was rather odd because I’ve seen this old guy and his dog out walking loads of times and usually the dog doesn’t take any notice but yesterday it came running straight up and bit me. Just a little yappy, snappy terrier type thing so nothing too serious but it drew blood so thought I had better go for a tetanus as I’ve no idea when I last had one, but certainly not since I’ve been here. The doctors said I must also report it which I wasn’t so keen on doing so I went and visited the owner this morning just to let him know and check if the dog had been vaccinated (it has) and to make sure I wouldn’t cause him any trouble. The 2nd January used to be a public holiday in Slovenia however it was cancelled as part of the crisis cost-saving measures. So you can imagine the public outcry yesterday when TV reporters visited parliament only to find the place empty. Hmm, enough said. Politicians – the same the world over!